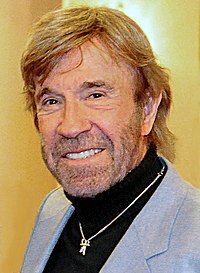 Carlos Ray "Chuck" Norris (born March 10, 1940) is an American martial artist and actor. He served in the United States Air Force. He became famous as a martial artist and started his own school, Chun Kuk Do. Norris was cast in a number of action movies, such as Way of the Dragon. He was The Cannon Group's star in the 1980s. He played Cordell Walker in the action television series Walker, Texas Ranger from 1993 to 2001. Norris is a politically conservative. He has written books on Christianity and supports Republican candidates and causes. In 2007 and 2008, he campaigned for former Arkansas Governor Mike Huckabee, who was running for the Republican nomination for President in 2008. In the 2012 election he endorsed former Speaker of the House Newt Gingrich. Norris also writes a column for the conservative website WorldNetDaily. 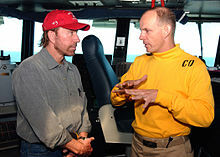 Wikimedia Commons has media related to Chuck Norris. This page was last changed on 18 August 2016, at 03:10.